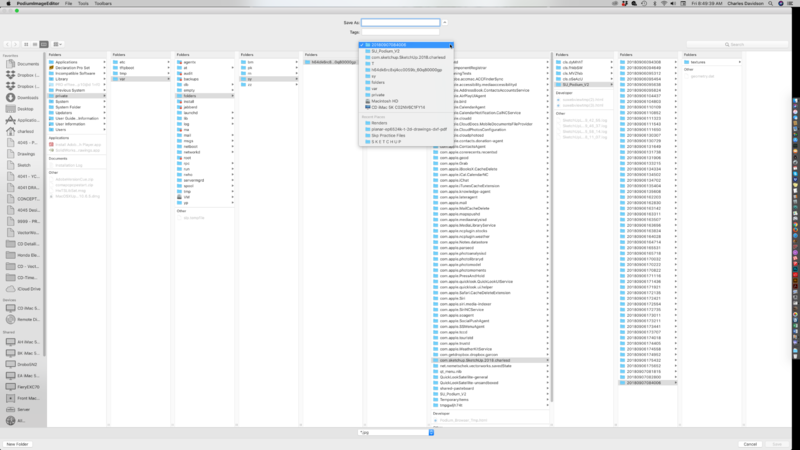 SU Podium and more > Categories > Main Messages Board > Where are renders filed when done? I'm new to Podium and new to the Forum. Question: where do I find the renderings that are produced by podium? I can look at the progress/preview images in the Podium Rendering Manager, and I set up a renderings folder on my HD. The only things that are sent to that folder are items from the Extensions / Generate command, like texture jpegs and render scripts, but no image of the rendering. Also, when I hit the Edit button on the Rendering Manager (with a render selected) no image loads in the editor. This Forum has a few threads about this problem. I also have this problem on my office machine. For some reason Podium won’t save renders to either the model or custom folders. I am able to edit the images, and I save them that way. I work on a secure network so there are any number of potential problems. It looks like there is an issue with something above the way your machine is configured. Not being able to view images or edit them is pretty rare. Which folder have you configured for saving your image? Can you give me the file path? We do have occasional issues with the length of the file path and accented, foreign or non-alphanumeric characters in file names though. Thanks to you and davew for your replies. I have since found where the renderings have been going. I have also been able to create a save folder in the Options Palette. The software has been putting the renders in a very obscure OS related area on the HD (image attached). But from that folder, I am able to navigate to my custom save folder (see "Recent Places/Renders" at the bottom of the file destination drop-down menu) when I save the render from the Render Editor app. The Editor app wants to save the render file to that obscure location. And at that location there are folders with render scripts, but no render image files, just texture files. Long story short, I'm full up and running, making renders and saving them to an accessible folder on my HD. The only real issue I'm now having is the rather unintuitive file destination chosen by the software. I'd be curious to know why that happens. I've got it working. See my reply to BigStick below. This is indeed an obscure path, and it's designed to be a temporary folder. Images shouldn't normally be saved there. they should either be saved in the model folder or in the designated folder. Occasionally, despite the folder path being explicitly declared, it doesn't work, which means that renders end up in the difficult to find temporary folder! Because the image editor works for me, I haven't had to dig around in the temporary folder path to find the images. It's worth noting that this folder path is different on every machine. This is the temporary folder where SU_Poidum_v2 saves the exported textures and .dat file. As Big Stick noted the rendered images does not get saved here.